OPE Store: Christmas sale begins! To celebrate the run-up to Christmas, for the the entire month of December, you can pick up an Only Pro Evolutions t-shirt from the OPE store for the bargain price of just £9.99! We're feeling very festive this year, so we're offering all OPE fans this exclusive deal. 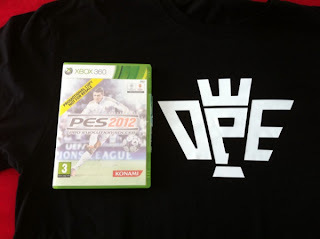 And don't forget, if you pick up something from our store, you'll also have a chance to win a limited edition PES 2012 t-shirt! Follow us on Twitter and Facebook, as we'll be giving some tees away as Christmas presents to some of our loyal fans.